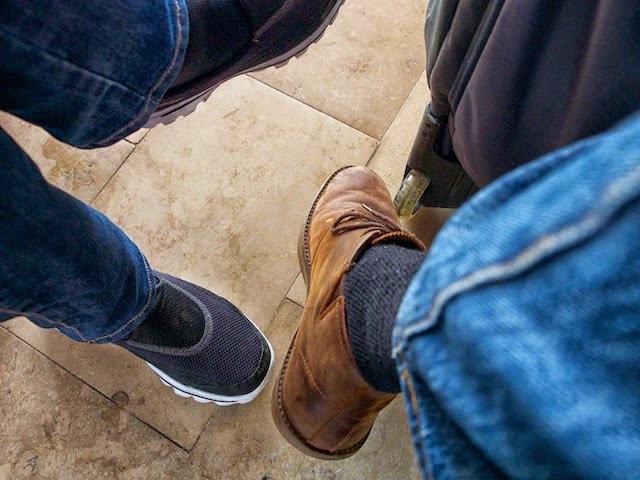 On any long journey, one spends an inordinate amount of time looking at one’s feet. We’ve never done the “P to P” analysis before, that is to say “Pillow to Pillow”, and now that we have it turns out the statistics of our journey were far more interesting to contemplate than the various patterns of carpet and travertine we’d enjoyed during the journey. By the time we had our heads down for a snooze in Lunéville this afternoon, it had been forty-six hours since being rudely awakened by our alarm, warning that we had to leave our pillow and make our way to the airport. In the intervening time, we had travelled by planes (two) and trains (two) and automobiles (two if you include the bus) and had spent an astonishing fifteen hours of our journey simply waiting, staring variously at the floor or ceiling in all of four airport lounges, two train stations and two cafés. Inspired no doubt by a subliminal message from the life support system we are attached to during flight (although others may call it “in flight entertainment”), the other of us has concluded that it is not time travel, that instead the aeroplanes are taking us through worm-holes in the universe. We arrive completely oriented yet disoriented at the same time, without any need to regain our bearings and except that our brains are still sitting somewhere between our destination and our departure point it is as though nothing as happened since last we were here. Even the clothes we are wearing are the same, although she has new shoes, a fact which only seems to highlight the normality of it all. Is this how amnesia feels? Puzzled as always, we are back.